American College Testing (ACT) is a standardised test that is an important determinant in gaining admission to most colleges and universities in the United States. Administered both in United States and other countries around the world, ACT assesses college academic readiness of both native and international students under a standardised format. The ACT test has five areas, namely English, Mathematics, Reading, Science and Writing (optional), and assesses knowledge and skills you would have learnt throughout school. This differentiates ACT from the Scholastic Aptitude Test (SAT), which is based more on aptitude. If you are exploring undergraduate academic opportunities in the United States after school, you will find that U.S. universities usually require both their national and international students to take a standardised test to assess their candidature. Many colleges and universities in United States offering four-year course programmes accept the ACT. 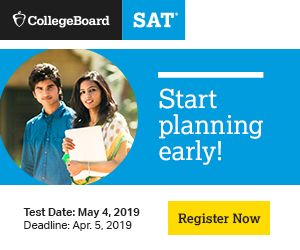 Though most accept both SAT and ACT, it is advised that you check the application criteria for all colleges you wish to apply to since some colleges require students to take the SAT Reasoning Test. Students across grade levels can sit for the ACT test, but it is commonly taken by students who have completed or are appearing for 10+2 secondary education exams, and looking to apply to U.S. undergraduate programmes. Students appearing for 10+1 examinations can also take the ACT Test, ahead of the actual admission season. ACT scores remain valid for five years after the date of the test. You can sit for an ACT (No Writing) test or opt for the ACT Plus Writing (with an optional Writing Test). Check beforehand if the U.S. college you want to attend requires or recommends the ACT Writing Test. The optional Writing Test is a 30-minute essay on one writing prompt and measures high school English writing and entry-level college composition skills. The actual duration of the test is two hours and 55 minutes (three hours and 25 minutes for ACT Plus Writing), but it can take anywhere between four and five hours total, including breaks and administrative instructions. Currently, the exam is conducted in a paper-and-pencil format, but there are reports of it moving to an online format in the near future. The raw score for each section is converted into a scaled score, which ranges between one and 36. You will receive a scaled score for each multiple choice section (Math, English, Reading and Science) in the final report. The ACT Writing Test is scored differently. Two readers score a student's Writing Test essay between one and six, with six being the highest possible score. Scores of both readers are added to generate a Writing subscore (ranging between two and 12). The student's Writing subscore and the English score from the multiple choice section are then scaled to generate the Combined English/Writing score, which ranges between one and 36, with 36 being the highest possible score. It is important to note that your composite ACT score remains separate and is not affected by either the Writing subscore or the Combined English/Writing score. You will be able to view your scores online about two and a half weeks after the test date, but the score reports are only released between three to eight weeks post the date of the exam (applicable for both U.S. and international tests). However, if you took the Writing Test too, your score reports are released only after all tests have been scored, which is generally within five to eight weeks after the test date. You can send your ACT test scores to more colleges apart from those you chose at the time of registration at an extra cost. Further, if you attempt the ACT test multiple times, you can also select which test date scores to submit to colleges. You can find out the exact dates offered at a test centre in/near your city at the ACT official website. Registration for ACT during the academic year 2017-148 begins from early July 2017. As an international student, you will be required to register for the ACT on the Web. Create a free ACT account by providing necessary information, click the Register to Test button and complete the registration process. Registration requires a valid passport and an exam fee. A new addition to the application process, most likely to be implemented internationally from October test dates, will make the inclusion of a candidate's photograph essential. It can be uploaded via the ACT website, mail or mobile device. The ACT Web account will also allow you to access other ACT services like viewing your scores and score report, as well as making changes to the registration information provided by you. The ACT exam fee for international students is US $65.00 (without Writing) and $80.50 if you decide to take the optional Writing Test too. This fee includes reports that will be sent to you, your high school and four colleges of your choice. Additional fees are levied for adding college choices. Payment for the exam is made by a valid MasterCard, VISA and American Express or DISCOVER card, and is completed during the registration process. Nimrata Grewal is a freelance writer based in Mumbai, India and has previously worked for a leading national newspaper and media company. She has experience writing on careers, job advice and job trends. She is trained as a microbiologist with a master’s degree in biomedical sciences before she decided to pursue her passion in writing seven years ago.